Apus, the Bird of Paradise, is a very small southern constellation with no spectacular deep sky objects. The most significat patch of sky here is this one around IC4633, a faint galaxy surrounded by a very faint Integrated Flux Nebula. IFN is a gauze of gas and dust that glows by reflecting all the collective light of the Milky Way. Its material is so thin that light from external galaxies shine through it. 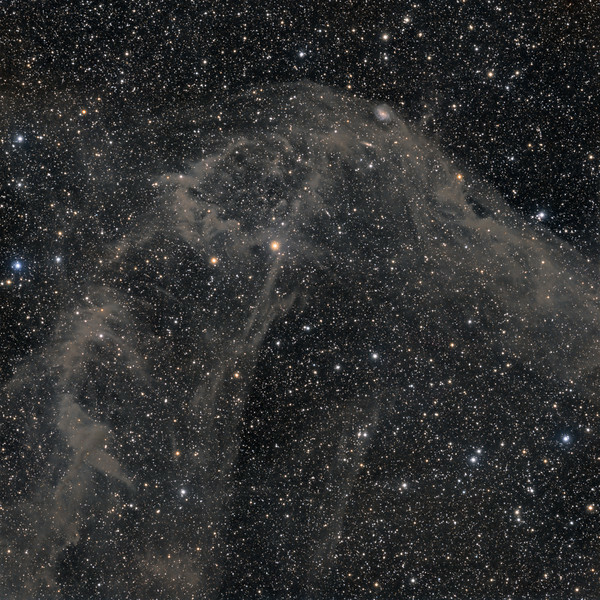 IC 4633 (at centre top) is conspicuous on the edge of the emission glow while just below lies the bright sliver of a distant edge-on spiral or lenticular system, IC4635.